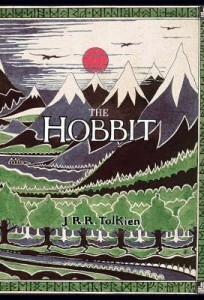 The Hobbit is a perfect example of classic fantasy writing suitable for adults and children alike. It’s a tale that has influenced my reading preferences since I first read it at age 9, and rereading it was a pleasure some 17 years later. It is quite a simple tale, a comfortable life interrupted by the promise of adventure, and a quest to reclaim a lost homeland from a great evil. There are wizards, elves, trolls, goblins, a dragon, and lots and lots of dwarves; all the characters that high fantasy is known, and loved, for having. There are plenty of fantasy landscapes traversed, and there would be few modern day readers who haven’t at least seen the movie trailers and be able to vividly picture the wild New Zealand landscapes that so accurately reflect the world that Tolkien describes. But there is also another layer to this story that I think makes it such an enduring classic. The Hobbit really is a story about a very ordinary person (Bilbo Baggins) who, without any special skills or training, just a sensible head on his shoulders and a generous heart, is able to overcome challenges and resolve conflicts much bigger than he even realises. There is something profoundly moving about Bilbo’s courage and loyalty that grows throughout the book, and Thorin’s farewell had me all misty eyed. Though the language and style might be more formal than modern middle grade fiction I still think this is a great book for younger readers. There is something about the rhythm of the story that feels like a father reading to his children, each chapter just the right length to read before falling asleep. Given that Tolkien wrote The Hobbit for his son I guess that is not surprising. It is also important to note that the book does not talk down to its audience or attempt to over-explain. There were certainly elements of the story that went over my head the first time I read it, and probably the next few times I reread it as well, but that never detracted from my enjoyment of the tale as it unfolded. One of the few things that did bother me on re-reading it now was the complete lack of female characters. As far as I can tell, while the story is fresh in my mind, there isn’t a single female character with dialogue in the whole book. This doesn’t put me off enough to lower my star rating or lessen my overall enjoyment of the book, but I think that it shows how far fantasy literature has come since 1937 that something like this really stands out as unusual. I would recommend this for confident readers aged 10 and up, but it is probably best suited to readers aged 13 and above. Fans of Lord of the Rings will find this a simpler, more innocent tale, to be enjoyed at a leisurely pace, and fans of the Hobbit films will find the plot distinctly lacking in the plot holes that plagued the adaptation.